The STB was new in 1992 & the PORT one was removed & replaced in 2016 with a reconditioned unit. 2 x Mainsail - 1 x Headsail. Hull is 2 pack coat below waterline. The Heavenly Twin MK11 is a very established build and capable of many circumnavigations. Indeed, many have! She has been well maintained by the current owner and with a surprising amount of space. The large aft cabin can be easily converted to two double cabins. There isa full canopy included to cover the cockpit that will enable dry passage from aft cabin to forward saloon. She will manoeuvre easily under engine power making her adept in coastal or river cruising. The STB engine was new in 1992 & the PORT one was removed & replaced in 2016 with a reconditioned unit. A really stable and capable boat to go anywhere! 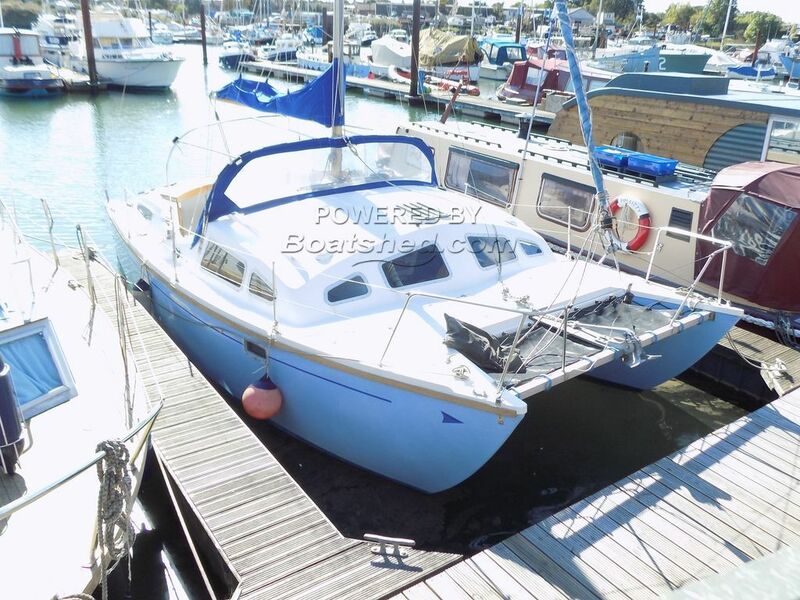 This Heavenly Twins 26 Catamaran has been personally photographed and viewed by Geoff Jaquest of Boatshed Suffolk. Click here for contact details.